Last year I was standing in front of New York Magazine art critic Jerry Saltz (if you ever watched Bravo's "Work of Art: the Next Great Artist" he was one of the judges) trying to answer his question to me as I was awkwardly handing him a book to sign before a talk, "So, Amanda, what kind of artist are you?" I have always found it difficult to classify my work, because I do paint a variety of subjects and often do a little abstract and a little representational work too. Like a deer in headlights I blurted out "surreal" before we shared more chit-chat, because I have heard that descriptive the most from my viewers. But I have also heard people say I paint post-modern, abstract, still-life, urban, fantasy, and traditional. Hmm Where are these coming from? I sat down with all my images and did some research akin to my art history class days. I can describe the heck out of a thing, but am not a fan of the "label." Fantasy seems to fit, as it incorporates everything I do that is my way, my imagination, my soul, and my interpretation of the history and stories which fascinate me. I have always had a quite large imagination, and I have drawn creatures of fantasy since I was very young. 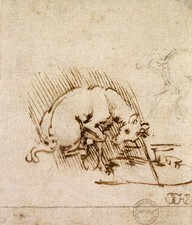 Earliest inspirations for me were books like Le Petit Prince, D'Aulaires Book of Greek Myths, and others... in my search I even found a unicorn sketched by Da Vinci! Why did I not remember that? Fantasy touches us all to some degree... whether you picked up a comic book, pretended to be in another land or have an imaginary friend when you were younger (yes I have had several and I have made drawings of them all! ), or were simply entranced by "Where the Wild Things Are" as a child :) While I paint many animals and many women as key elements in my pieces, my goal is to infiltrate a bit of fantasy into each one... I hope my newest paintings will bring some magic into your life!